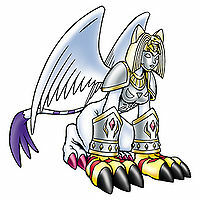 An Armor-level Holy Beast Digimon that evolved through the power of the "Digimental of Light". 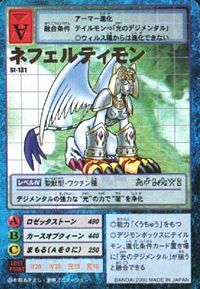 The "Digimental of Light" has the attribute of "Light", and those that don this Digimental will have the ability to purify darkness with the intense power of light. Even though Tailmon is not a descendant of an ancient species, it became able to Armor evolve by awakening the special abilities that lay dormant within its composition data. Its Special Moves are producing a red, high-temperature beam from the ornament on its brow (Curse of Queen), and summoning a megalith with ancient inscriptions engraved in Digimoji to attack the enemy (Rosetta Stone). A Holy Beast Digimon that evolved due to the Digimental of Light. Special Moves - Produces a red, high-temperature beam from the ornament on its brow (Curse of Queen), and summons a megalith with ancient inscriptions engraved in Digimoji to attack the enemy (Rosetta Stone). 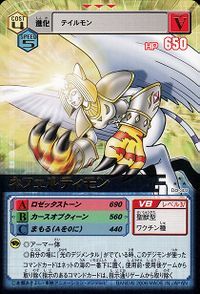 A Holy Beast Digimon that Armor evolved from Tailmon with the Digimental of Light. Its figure, which flies elegantly through the sky with its white wings, and its unique methods of attack convey its mystic power. Its Special Move is firing a beam from its snake-shaped ornament (Curse of Queen). A Holy Beast Digimon that purifies darkness with the intense power of light. Its Special Move is producing a red, high-temperature beam from the ornament on its brow (Curse of Queen). 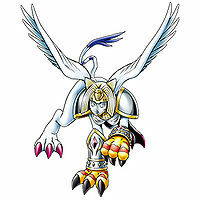 A Holy Beast Digimon that evolved from Tailmon due to the Digimental of Light. It is able to bring out 100% of the Digimental of Light's power, and has the ability to purify darkness with powerful force. 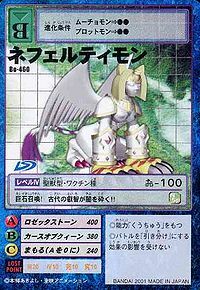 It is a form of Tailmon that Armor evolved with the "Digimental of Light". Because the attribute of Light contained in the Digimental was exhibited to its fullest, it acquired the powerful force to remove darkness. Title: 「微笑みの光」 — "Light of Smiles"
Nefertiti was an Egyptian queen. Curse of Queen  カースオブクィーン Kāsu obu Kuīn Cat's Eye Beam/Beam of Isis/Queen's Curse Produces a red, high-temperature beam from the ornament on its brow. Rosetta Stone  ロゼッタストーン Rozetta Sutōn Rocking Stone Summons a megalith with ancient inscriptions engraved in Digimoji to attack the enemy. 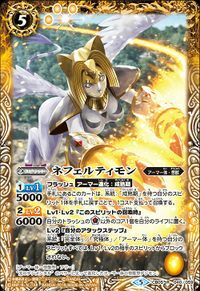 Sanctuary Bind  サンクチュアリーバインド Sankuchuarī Baindo Golden Noose Combines powers with Pegasmon to create a ring/rope of light to ensnare the enemy. Paw of Queen  バウオブクイーン Bau obu Kuīn Queen's Paw Fires jewels from its leg armor. Slams down on an opponent from the air with its forepaws. Nile Jewelry  ナイルジュエリー Nairu Juerī Queen's Paw Fires explosive projectiles from its leg armor. 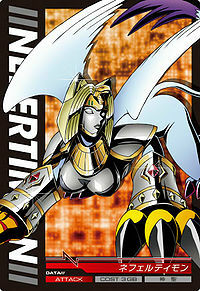 Nefertimon is the partner of Yagami Hikari, evolving from Tailmon using the Digimental of Light. A Nefertimon is a servant of Ofanimon who unknowingly held the DigiCode for Ofanimon's palace. 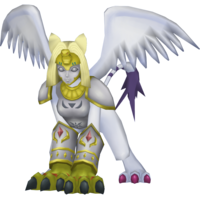 She is later scanned by the Royal Knights, and her DigiCode is used to further the revival of Lucemon. Nefertimon is a playable character. 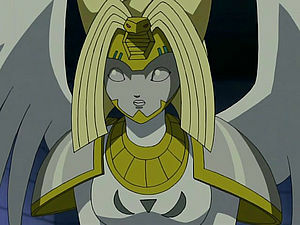 She evolves from Tailmon and can evolve to Angewomon. 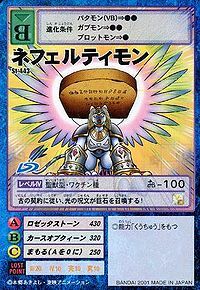 Nefertimon is only obtainable as a collectible card. 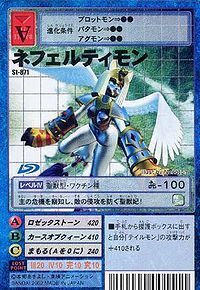 Its card is part of the Digimental of Light (光のデジメンタル Hikari no Dejimentaru) set. 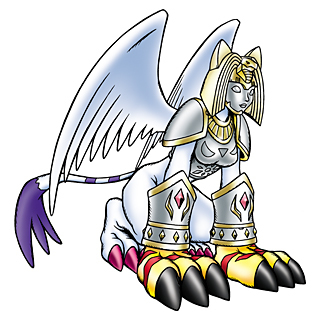 Nefertimon is available as a Digimon Medal. 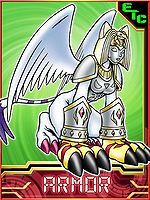 Nefertimon is available as a Digimon Card. 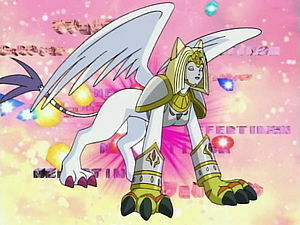 Nefertimon evolves from Tailmon using the Digimental of Light. It purges the darkness with the strength of the Digimental of Light. Abiding by an ancient contract, it summons a huge slab of stone with a spell of light! This holy beast queen can sense any danger towards its master, and will defend against enemy onslaught! It summons a giant tablet of stone! The wisdom of the ancients crushes through the darkness!! The Armor Evolved form of Tailmon using the Digimental of Light. Possessing the light element, it possesses the ability to cleanse the impurities of darkness with its intense power of light. An Armor-level Holy Beast Digimon that evolved through the power of the "Digimental of Light". ↑ 4.0 4.1 Digimon Adventure 02: "Digimental Up"
This page was last modified on 5 April 2019, at 21:02.